Distracted Driving Causes Iowa Motorcycle Crashes | Hupy and Abraham, S.C.
How does a distracted driver cause an Iowa motorcycle accident? What should I do if I’m hurt in this type of crash? You’ve probably seen the public service announcements and read the news headlines. Distracted driving is dangerous. Novice drivers to use a cell phone while driving. Any driver to text and drive. Eyes are off the road. Hands are off the steering wheel. Attention is off driving safely. In addition to cell phone use, this could include things such as eating, drinking, daydreaming, talking to a passenger, attending to kids, changing the music, or following directions. Any of these things could lead to a driver failing to see a motorcyclist and causing a serious accident. If you think that another driver’s distraction was the cause of your motorcycle accident, then you are going to have to prove it in order to recover damages. In other words, you are going to have to collect evidence that shows that it is more likely than not that the driver’s distraction caused the accident and that the accident resulted in your physical injuries. Collecting evidence at the scene of the accident. Getting a copy of the police report. Making sure you have contact information for witnesses. Getting prompt medical care for all your injuries. Talking to an experienced motorcycle accident lawyer who can guide you through the legal discovery process and help you get the information that you need to protect your rights. 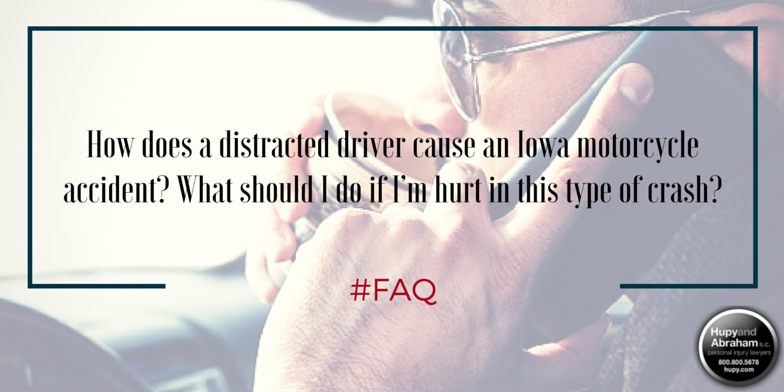 If you would like to learn more about what you can do to protect yourself after a distracted driver has hurt you, then please call us today at 1-800-800-5678 to schedule your own free, no-obligation consultation.